This week marked the arrival of the real Cape Region 2009 summer season. Although summer usually and officially begins in late June, this has been anything but a normal summer. It’s been relatively dry, relatively cool, and with hardly any humidity, at least of the usual stifling kind. Those pleasant conditions held until this past week, which has been marked by occasionally torrential showers, thunderstorms, high heat, and equally high humidity. On some of the region’s fairways the sudden onset of heavy rains has caused some weird playing conditions. On July 27, for example, I was chatting with Kings Creek Country Club pro Kevin Wiest. Diane Herndon, the new Kings Creek club champion, came up to Wiest with her playing partner, Luanne Zabytko. Herndon and Zabytko asked for guidance regarding how to play and how to score when their golf balls landed on what they called “bubbles” in the second hole’s fairway. From their description, it sounded like segments of fairway turf were floating above the subsurface. When the golfers stepped onto these bubbles, the turf would press down under the pressure of their feet, but immediately rise up on the unstepped turf nearby, much like a balloon. They worried about the ball moving as it sat on the bubbles. I suggested that as long as the golfer hadn’t addressed the ball before it moved, the fact that it moved as she approached the bubble shouldn’t make a difference. I was thinking, “rub of the green,” and all that. Herndon and her friend pointed out, however, that the situation was more analogous to the rule that penalizes golfers for moving sticks or other items near a golf ball, such as to make the ball move inadvertently, but with a penalty stroke added. 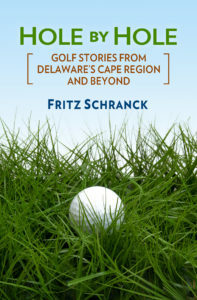 Wiest suggested that if it happened again, the golfer should play two balls for the hole, and take it up with either the rules committee for the competition, or with the USGA. He was stumped, and didn’t mind saying so. Herndon agreed to call the USGA, and also agreed to call me later with the USGA’s response. The next day, the guardians of the game told Herndon that they’ve had this bubbling turf situation come to their attention on several occasions. She said the USGA suggested that the bubbles should be considered an “abnormal ground condition,” under Rule 25-1 of the Rules of Golf. It sounded like the USGA folks were assuming that casual water caused the bubbles, or that the bubble turf should be considered ground under repair—or at least, ground that should be under repair, once it dried out enough to do something about it. If the golf ball lands on these abnormal spots, the player can take a free lift and drop the ball without penalty within one club length of, but not closer to the hole than, the nearest point of relief. The rule also deals with similar abnormal conditions in a bunker or on the putting green. For some of these bubbles, it’s possible that the point of relief will be some distance away. The golfer facing this situation should not automatically assume that taking relief is the best option. She might be better off taking her chance with a swing off the top of the bubble, while hoping she doesn’t pop it. Think of it as dirt schrapnel.